Automatic watches are notorious for being expensive. But, you can still get a high quality automatic watch for under $500! In this post, I’ve compiled a list of 15 great watches that someone with $500 to spare can buy. 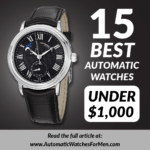 I’d like to highlight that I intend for this list to help those that really wants to buy his/her best automatic watch within a $500 budget. Which is why most of the watches in this list is around $300 to $500 tops. If you’re looking for something cheaper, you can check out my previous post on the best automatic watches under $200 here. Alternatively, if you can also check my list of the best automatic watches under $1,000 where I’ve listed the best watch for every budget. My name is Isaac and I’ve always love automatic watches. They are quite a magnificent creation that have lasted the test of time – arguably one of the current invention from centuries ago that can still be purchased easily. While other more advanced watches such as the quartz or smartwatches are very popular, automatic watches still remain steadfast and desirable especially among watch fans. The main attraction of automatic watches is in its capability to run without electricity – entirely dependent on the laws of physics by using mechanical parts inside it. Also, who can resist that ever moving balance wheel assembly and the smooth sweeping second hand? It’s truly a beautiful invention. 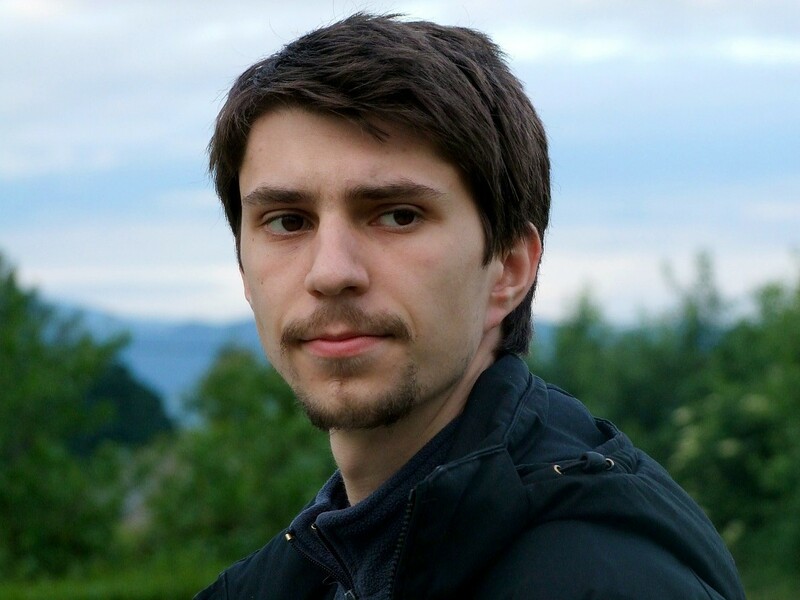 After a few years reading, shopping and owning automatic watches, I’ve decided to create this website to record my thoughts. Here, I’ve listed 15 of the best automatic watches under $500 that you can buy. p/s: I’ve taken the online prices of the watches for this list as a basis as it’s much easier to get than the MSRP (and also because I love shopping online for watches LOL!). So the price could fluctuate a bit and might go over $500 at some point of time. 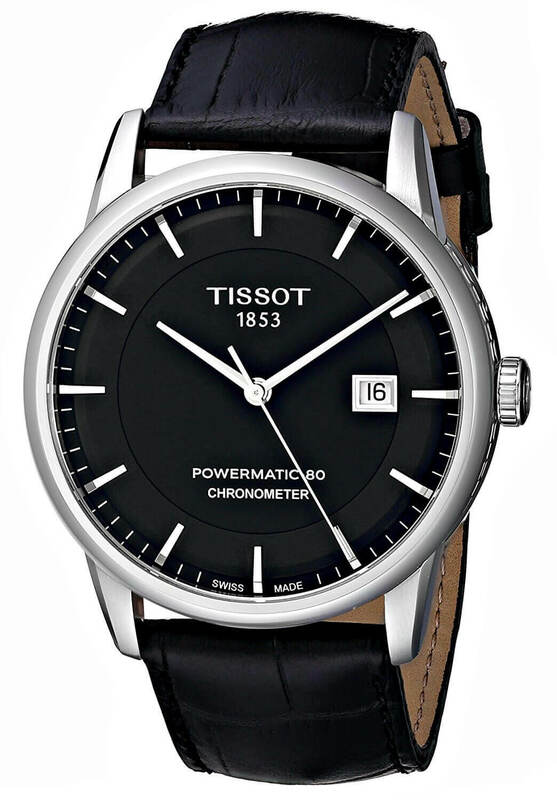 Starting off this list is a watch that I still can’t believe exist: the Tissot Powermatic80 Chronometer. Yup, you read that right. It’s a chronometer for around $500! For those that don’t know about it, a chronometer is a term for a very accurate automatic watch. Generally, accuracy is not automatic watch’s strength as most of them can have up to +/-20 seconds of deviation per day. A chronometer is at least able to guarantee an accuracy of maximum +/-6 seconds per day, which is huge if you ask me. And these kind of watches (the chronometers that is) are traditionally priced at $1,000 and above. So you’ll definitely understand how excited I am with this Tissot. The value for money they give with this watch is absolutely outrageous! Apart from that, only those chronometers that are certified by COSC or (Contrôle Officiel Suisse des Chronomètres, the Swiss testing center) is allowed to use the term “Chronometer” on its dial face. So another plus point for the Tissot in getting them certified! In addition to its higher than ordinary accuracy, the ETA Powermatic 80 Caliber C07.111 automatic movement also comes with a generous 80 hours power reserve, a huge improvement over the typical 38-50 hours power reserve that most automatic watches have (as you’ll see in this list). The Tissot Powermatic80 Chronometer features a simpler black dial on a stainless steel case – simple, understated and elegantly done. As it’s not too dressy, it scores lots of points in the versatility department. I can easily foresee myself wearing this to office and also to parties in the evenings. For a watch that looks good as well as having the best that an automatic watch can offer, the Tissot Powermatic80 Chronometer is definitely one watch that you have to seriously consider. 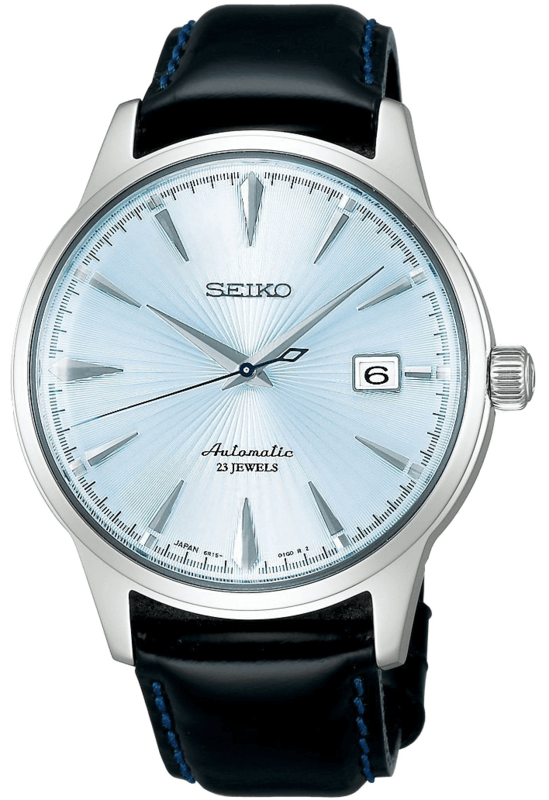 The next watch on this list is a very popular watch: Seiko SARB033. It’s one of Seiko’s popular automatic watches due to its elegant design and good specifications – all in one cheap package of usually less than $400 online! I’ve had the pleasure of owning one (read my personal review of the Seiko SARB033 here for more pictures) and all I can say is this is one great watch to own. I’ve always had a preference for smaller 38-40 mm-ish watches due to my small wrist size, and this watch delivers it perfectly. The case construction is one of the best in this price range as Seiko seemed to not hold any punches in this regard. The SARB033 case definitely brings to shame other more expensive watches especially from the Swiss/Western companies. I just love how the case has a natural sweep and curves down to hug my wrist. It’s finishing is also quite good with some polishing streaks amidst a predominantly brushed surface. And the best part of this watch? It’s versatility. I’ve worn this to the office, to dates, casual parties, even to black tie events. Perhaps the only place where the watch feels out of place is outdoor (beaches, etc.). Apart from that, the watch fits in perfectly with anything that I wore! It’s definitely a versatile piece and a watch that you should consider if you want a fit-for-all watch. By the way, there’s also a white face model of the watch (the Seiko SARB035) which is more dressy in my opinion. The Khaki King watches are the face of the Hamilton brand, and it’s rightfully so for the Hamilton Khaki King to be included in this list. Apart from being one of the cheapest automatic watch of western made these days, the Khaki King watch is also an iconic watch. With only a glimpse of the military style dial and the unique full day display, we can easily spot the Khaki King watch even from afar. The ruggedness of the design makes the watch a very good choice for casual use, with the brown leather strap looks to be well fit to be worn with jeans! I also like the full day display: no more guessing about what day it is from the shortened day version in most other watches. This makes the watch very useful even for daily use. One small issue that I have with the watch is the low water resistance at 50 m. It’s a bit weird that a military watch can only has a mere 50 m water resistance… In my opinion, a 100 m water resistance is the bare minimum for utility type of watches. 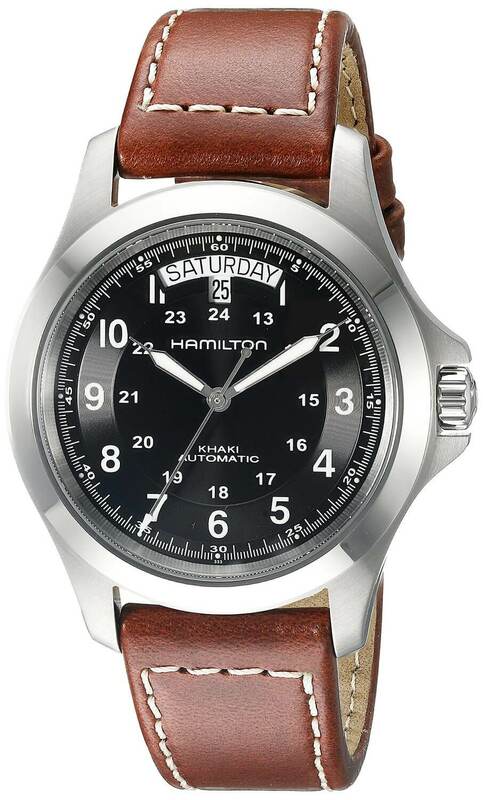 With that being said, the Hamilton Khaki King is still one of the most gorgeous and rugged military watch out there. 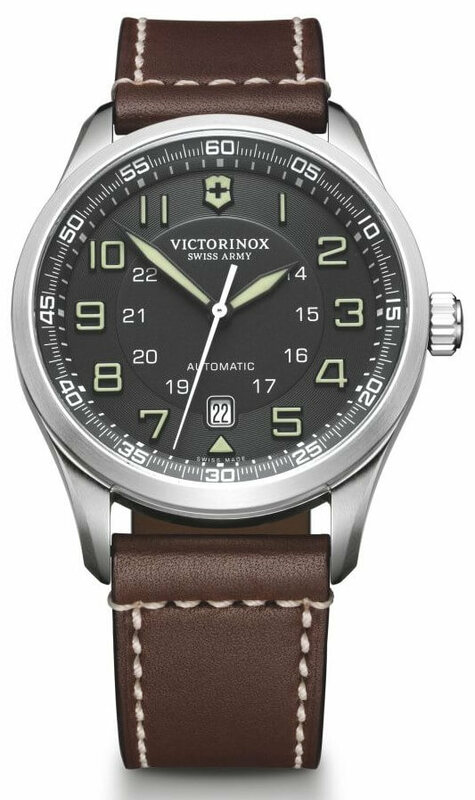 Continuing with military watch, the next watch in the list is from Victorinox Swiss Army, the AirBoss Mechanical. Originally, I didn’t want to include this watch in this list as its price is usually above $500 (though most of the times it’s lower than $600). But looking at the watch, it’s impossible for me to pass on it just because it’s a few dollars above the $500 mark! I mean, just look at this beauty. While the Khaki King before it is grittier, the AirBoss Mechanical looks more refined and beautiful, even for a military watch. I also love the full numeral markers – which by the way, is lumed too! Having a full numeral dial makes the watch a breeze to read time with compared to the more usual index markers. 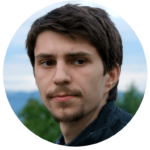 Its also moderately sized, further helping with legibility. And with full lume on it, there’s definitely no issue in telling time with this watch in the dark! In addition, the slight green shade of the hands/markers due to the SuperLuminova lume paints contrasts nicely with the gray dial face. It does lack a day display (compared to the Hamilton Khaki King above) but honestly, I seriously feel that Victorinox made a good decision to left that out as it won’t mesh well with the dial. 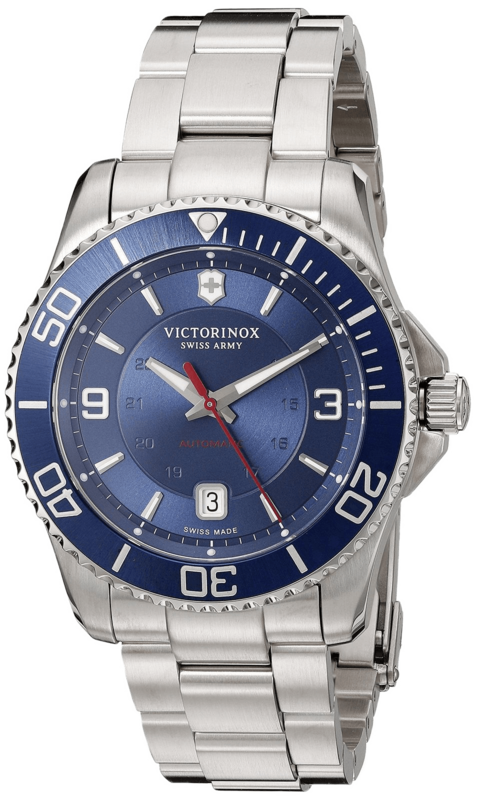 For a beautiful military watch (or you just love a full lumed watch), this Victorinox AirBoss Mechanical is the one to get! 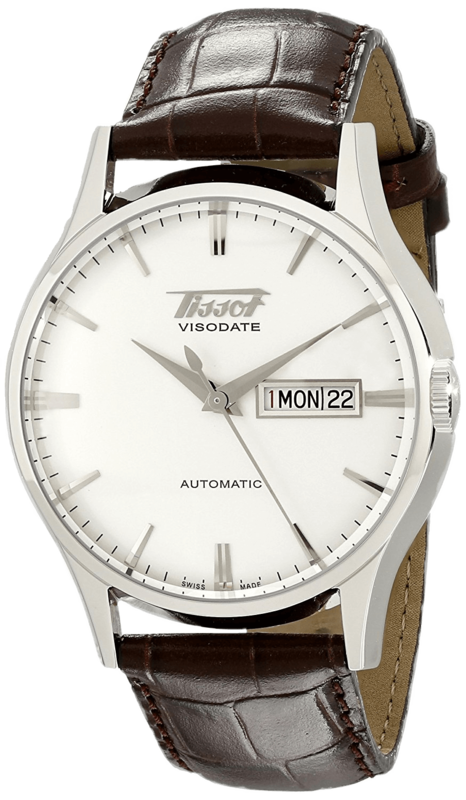 One of the best Swiss automatic watch under $500 is the Tissot Visodate. In my opinion, if you’re looking for a dress watch, with automatic movement, made in Swiss, and still affordable ($500 is considered entry level in the Swiss automatic watch world), the Tissot Visodate is my number one pick. For a start, it is from one of the most respected brand in watchmaking. 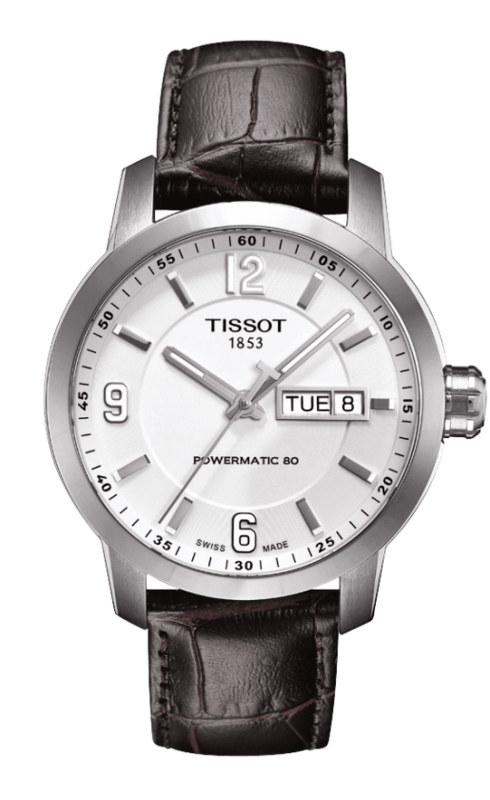 Tissot has been around for a long time, and is currently one of the biggest brands. It even withstand the quartz era when many automatic watch brands gone bust! That speak volumes about the brand. The Tissot Visodate is actually a re-production of Tissot’s vintage model of the same name but with great modernization in terms of the looks and movement. You can see that the Tissot logo on the watch face is an older version of the logo – marking how this model is a “Classic” model in their lineup. A ode to their rich and colorful history. Then, there’s the trusted ETA 2836-2 automatic movement inside it. Dated as it is, the movement works like a charm as many ETA owners can attest. As with many dress watches, there’s also an open caseback on the watch for us to peek at the ETA movement inside. If you’re looking for a beautiful dress watch with great specifications, this Tissot Visodate should be inside your shortlist =). 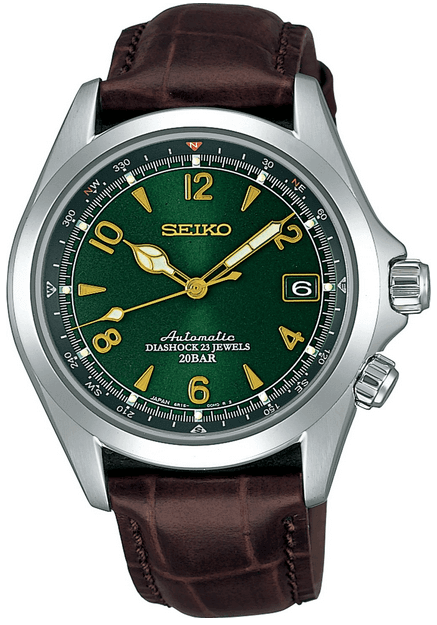 The next Seiko in this list is the Seiko SARB017 or more fondly known as the Alpinist watch. One interesting history about the watch is the Alpinist line up was conceived as a reference to Japan’s mountaineering community. Which is why you can see that the technical specification of the watch is higher than normal Seikos despite it having a charming green-gold dial. From the first look, we can see that the Seiko Alpinist is not your normal watch. I mean, where have you ever seen a watch with green dial, gold accents on the hands/markers, silver stainless steel case and brown leather band? It’s not really a good idea to put many colors on a watch, but somehow, Seiko managed to pull it off very well with this watch. I really like the green-gold combo as well as the classical type of hands. It shows a lot of character that is sorely missing in the current crop of watches. Speaking of its technical specification, there’s a compass chapter ring on the watch that can be operated by turning the knob on the 4 o’clock position, which I’m sure will be very handy for those going outdoor. In addition, the watch also has Diashock absorber to protect the watch and its Cal. 6R15 automatic movement from damage should it sustain any impact. Last but not least, Seiko also put a huge 20 bar or 200 m water resistance rating on the watch. This puts it on par and even beat some dive watches out there! Just be sure to change the leather strap to Nato or rubber or metal before going into water LOL! If you’re looking for something different with your next watch, the Seiko Alpinist SARB017 is definitely something that will worth your time to look into. Next on the list is the Tissot Le Locle. Just like the Visodate, it’s also part of the vintage collection of the brand. But this watch is a bit more special as the “Le Locle” is actually the name of the town where Tissot started some 150+ years ago. So to be putting the sacred name of its inception place surely means a lot to the watch. And we can easily see it from the classical styling put on it. For a start, there’s the roman numeral markers on the watch which gives it a special character to it. Then there’s also the guilloche pattern on the dial that, frankly speaking, looks astounding. I’ve handled the watch in person, and it’s truly a magnificent timepiece that you have to see for yourselves to make an accurate assessment. Everything about the watch design looks delicate and very very elegant. In terms of technical specification, the 39 mm stainless steel case houses an ETA 2824-2 automatic movement with 30 m water resistance. 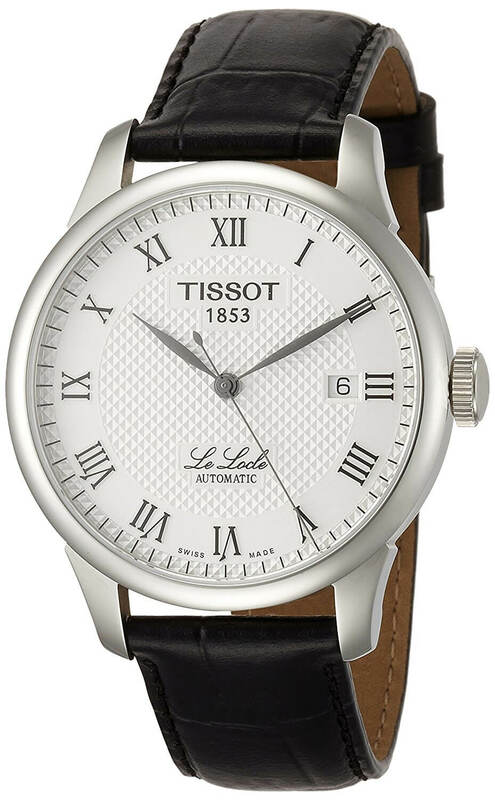 Suffice to say, the Tissot Le Locle is definitely one of the best dress watch in this price range. 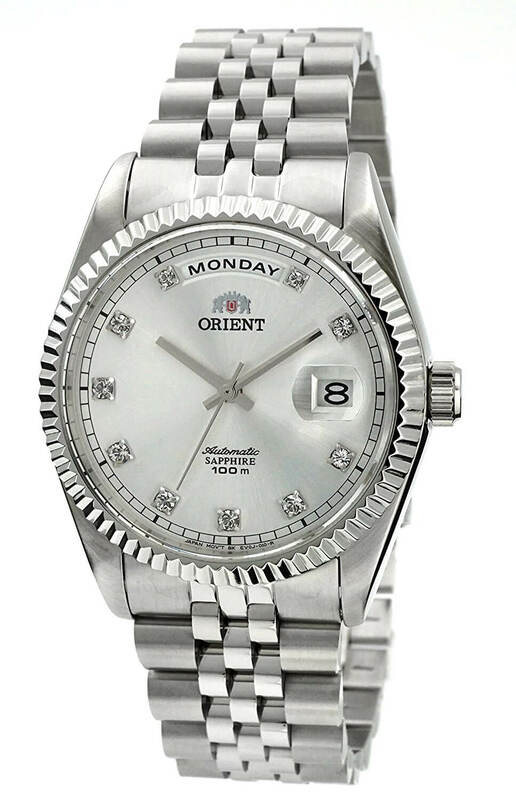 Most watch fans know that Orient is one of the most undervalued brands currently. Their watches are of high quality at a much lower price than what their Swiss or Japan (Seiko especially) would charge. The only thing holding them back is perhaps their lesser known branding. This Orient Star Retrograde is one watch that seeks to reinforce that. At just around $500, it has so much to offer. Again, it’s usually over the $500 mark but I feel that I really need to include this watch in this list as it’s such a good value for money! For start, the Orient Star is Orient’s premium lineup of watches and differs from their normal watches in terms of movement, aesthetic and finishing. This particular Orient Star Retrograde is definitely one gorgeous watch and not like any other Orient you have seen. It’s elegantly designed even with the busyness/complicated dial with power reserve indicator, day display and date display. I really like the white creamy dial combo with silver stainless steel elements on the watch. It gives the watch a very beautiful and wholesome look. Everything about the watch is on point, without anything out of place. It has a power reserve indicator, about the most useful feature one could get in any automatic watch – since most watches only has 38-40 hours power reserve it’s very important to know when the watch will drop dead to avoid it from happening. Besides, there’s a feeling of satisfaction when you see the needle move up when you manual wind it LOL! The use of a dedicated subdial for date is something that I really love. It’s different than the normal date display and make the watch looks more classical and elegant. And last but not the least, the retrograde day indicator. It literally means moving backwards, but retrograde has a kind of different meaning in watchmaking to describe the movement that automatically moves backward instead of running in full circle. You can see that Orient put this retrograde feature on the day indicator at the bottom of the watch: after Sunday, the needle will go backwards to Monday. With all of the above features, without a doubt the Orient Cal. 40A50 automatic movement inside it is one hell of a beast and definitely scores a lot of points in the movement department. If you’re in for a dress watch that also has a multitude of features (especially the very useful power reserve indicator), then the Orient Star Retrograde is a good choice. I’ve always like a good ol’ aviator watch – especially the ones with the B-Uhr Type B dial. It looks super awesome with the inverted minutes and hours markers (the minutes are way bigger than the hours, opposite of what a normal watch has). Which is why the Laco Aachen 861690 is one of the best bang for buck that you can get. It has the traditional Type-B dial with automatic movement inside it – all for just around $300 to $400 a piece! With those big markers and hands, there’s no question that this watch is perfectly legible and easy to tell time with. In fact, those markers and hands are filled with Superluminova lume making them usable even in the night. One trade offs that Laco made in this model is the use of the Laco 21 movement which was based on the Miyota 821A automatic movement instead of the usual ETA movements as their competitors. But for all intent and purposes, I don’t think that this is a big deal as the Miyota movements are widely used in many low-end automatic watches. They have made a good decision by using it in this watch, and helped make the watch affordable to many fans. 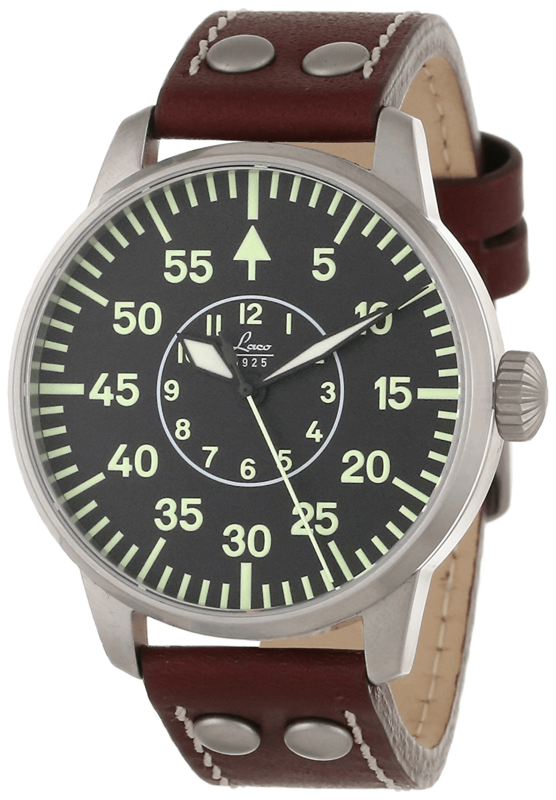 If you’re looking for a real aviator watch with automatic movement, the Laco Aachen 861690 is one of the best value for money watch you can get. As far as dial aesthetic is concerned, the Seiko Cocktail Time SARB065 gets full mark based on its dial design alone. 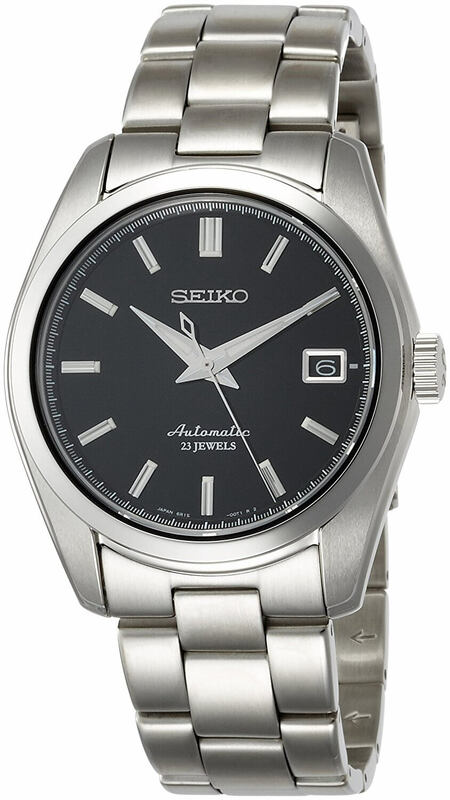 It’s another popular Seiko automatic watch model that is frequently sought after by fans. What makes the watch unique is the blue sunburst dial that changes depending on the angle of light and where you see it from. It’s a kind of metallic dial but the Cocktail Time uses many strips of dial to make it more unique. By the way, the reason why the watch is called Cocktail Time is because it was a collaboration with Japan’s top bartender, Shinobu Ishigaki. That’s another reason why the watch looks gorgeous as it is! In terms of technical specification, the watch has a moderate diameter of 40 mm, which is perfect for those with smaller wrists. Inside it there’s Seiko own Cal. 6R15 automatic movement with a good 50 hours power reserve. Perhaps one flaw of this watch is the use of hardlex crystal (a type of mineral crystal) instead of using the more scratch resistant sapphire crystal. But other than that, the Seiko Cocktail Time SARB065 is a great watch and has one of the most beautiful dial at this price range. If you think that the Orient President EV0J003W looks familiar, you’re actually on to something. In fact, the watch is a homage to the popular Rolex Day Date. It’s an elegant timepiece made to be a dress watch. What I love about the watch is the fluted or grooved pattern on its bezel that adds a lot of character to it. It meshes well with the stock jubilee bracelet that the watch comes with too. 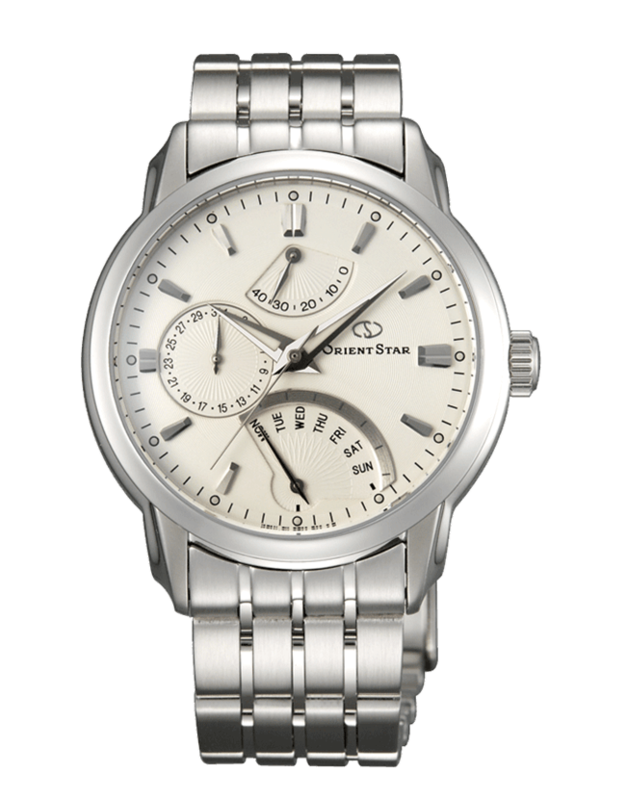 The use of white-silver color combination on the dial is another thing that I love about it. While I’d prefer that Orient uses a different markers (the crystal markers looks very similar to the diamonds on the Rolex), it looks very nice and compatible with the watch overall design. There’s also a full day display at the top of the dial and a date display with cyclops on the right for extra functionality. While the Khaki King watches is the face of Hamilton, the brand also have other lesser known but great designs. 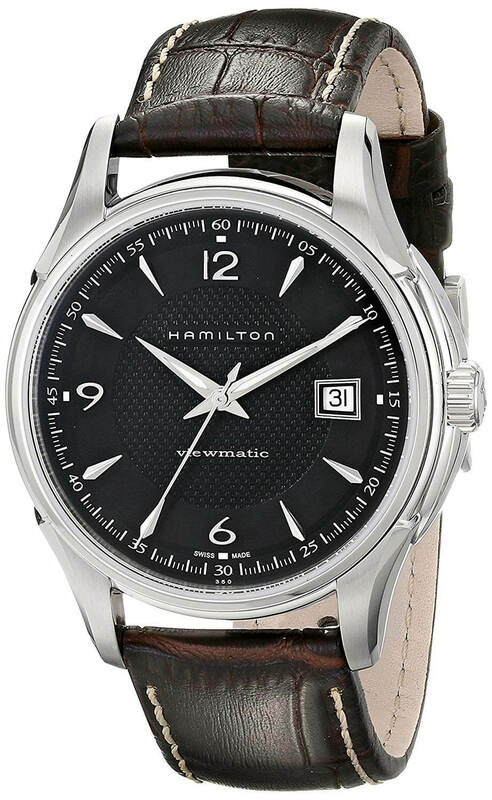 An example of that is this Hamilton Jazzmaster Viewmatic. Why the watch is named as such? Frankly, I’m don’t know. But one thing that is certain is that the watch is a beautiful dress watch. While it looks like the dial is a normal dial, upon closer inspection we can see that the center of the dial actually have a guilloche pattern on it. It’s a nice touch that added extra flair to the watch. The guilloche in this black dial version might be harder to see than the white version of the watch. I also like how the sides of the watch has a bit of edges around it instead of a boring straight line. We cannot see it from here but if you look at the pictures of the watch from different angles, you’ll see that the edges have intermittent polished and brushed finishing – sign of exquisite craftsmanship in watchmaking. Powering the watch is the tried-and-tested ETA 2824-2 automatic movement that has 38 hours power reserve in it. Want a nice dress watch? This Hamilton Jazzmaster Viewmatic should be on your shortlist! 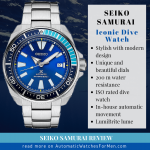 If you’re thinking of getting a real automatic dive watch, then this Seiko Sumo SBDC033 is definitely the one for you, as agreed by thousands of Seiko fans all over the world. (p/s: I’m also one of its proud owners. Check out my personal review of the watch here). But what did I mean by “real” dive watch? Aren’t those watches with rotating bezel on it dive watches too? Well, you’re not wrong there. Unidirectional rotating bezel is one of the main characteristic of a dive watch. And so does a good water resistance rating. But what most other watches lack is compliance to ISO 6425, the international standard for dive watches. It tables out a list of items that a watch need to comply to before can be certified a “dive watch” such as reliability under water, condensation test, the crown toughness to external force, shock resistance and other myriad physical attributes. Only watches that passes those requirements can put the “Diver’s XXXm” on its dial. And this beauty is one of them! In addition to the high technical specification, the Seiko Sumo also has very functional – and yet beautiful construction and design. It’s dial is simple with over-sized markers and hands making it a pleasant thing to look at in the dark thanks to the huge lume real estate. The rotating bezel glides smoothly with satisfying clicks – so much so I’ve made a habit of mindlessly rotating the bezel at any chance that I get LOL! Coming into it’s case, it will definitely command some wrist presence due to the 44 mm diameter. And with that size, it has a bit of heft to it – something that I really look forward when wearing it. The closest thing that I can describe about this is a heavy watch just gives you that manly feeling when wearing it. Not to mention the case is a work of art by itself. It has multiple surfaces on it with intermittent brushed and polished surfaces finely executed by watchmakers at Seiko. At the other side of dive watch, there’s the Victorinox Maverick. 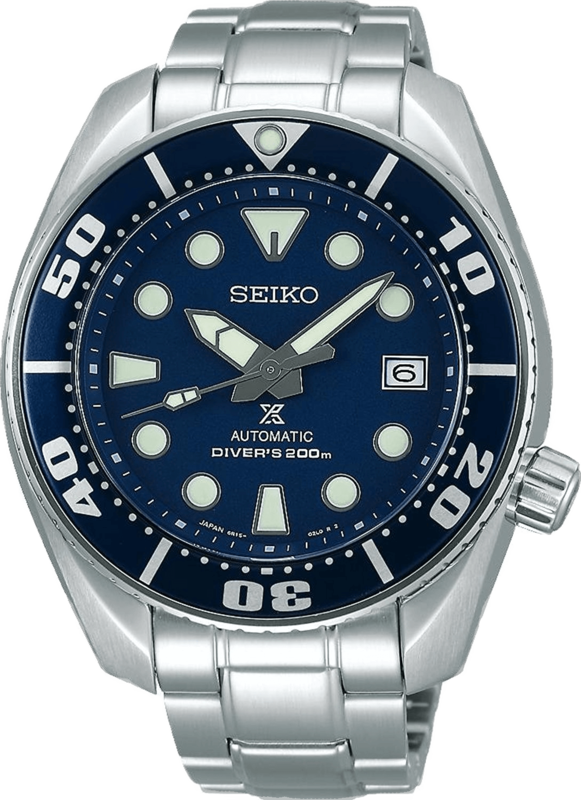 While the Seiko Sumo above is geared towards diving functionality, this Maverick (you gotta admit that this name is so cool for a watch!) is designed more towards aesthetic rather than “real dive watch” function. But of course, that’s not entirely a bad thing. I mean, almost 99% of those buying dive watches never bring it even close to water. So then, why bother with full dive watch functionality right? There’s only 100 m water resistance, low amount of lume, no screw down crown and there’s also an open caseback. Without a doubt, the Victorinox Maverick is design for desk divers rather than for real divers. Let us look at the watch design then. It has the rotating bezel which is one of dive watch’s main characteristic. The blue colors make the watch look very beautiful (there’s also a gray color version too). It might not shown in this picture but the bezel and the dial are actually having metallic sunburst effect on it, causing it to shine beautifully! A beautiful watch? You bet! I also like the explorer style markers as the “3” and “9” makes telling time much easier than a full index markers. From the looks department, it is evident that Victorinox Swiss Army had a winner here. Not to mention the build quality that is associated with the brand – it makes the watch so much more desirable than others. If you would like to get a beautiful dive watch – but don’t necessary need the full functionality of a real dive watch – then this Victorinox Maverick is a very good choice. The last watch in this list is the Tissot PRC200 Powermatic80. It’s a casual/sporty watch but with a sort of elegance that is not present with any other Tissot’s sports watch. There are a few color variations of the model (black and blue as far as I know) but I love this white-silver color scheme the most as it’s so much more beautiful. I mean, a beautiful sports watch is definitely a good thing to have right? The dial is simple with the usual 3-hands and day date display (courtesy of the ETA 2824-2 automatic movement inside) but it’s perfectly executed. You can see the white dial meshes with the silver stainless steel of the hands, markers and the bezel/case with little to no effort. And that brown leather strap just completes this watch! Some sporty elements can also be spotted on this watch. For example, the big crown is definitely there to give a sporty vibe. In addition, there are lumes on the hands and markers – even the explorer (12, 6 & 9) markers have lumes! I’m pretty sure the watch is a breeze to tell time with, during the day and nighttime. In addition to the beautiful and sporty exterior, the watch is run by an ETA Powermatic 80.121 automatic movement. It’s a latest movement by the ETA/Swatch group (of which Tissot is one of its brands) with a huge 80 hours power reserve! If you’ve owned an automatic watch before, you’ll know the struggle to keep that watch running continuously. A normal automatic will only run for about 40 hours before you need to wear or manual wind it again. So if you want to get a sports/casual watch with gorgeous design and huge power reserve? This Tissot PRC200 Powermatic80 is the one you should get. I hope that you love this list of the best automatic watches under $500 and enjoy reading it, as much as I’ve enjoyed researching and writing it! 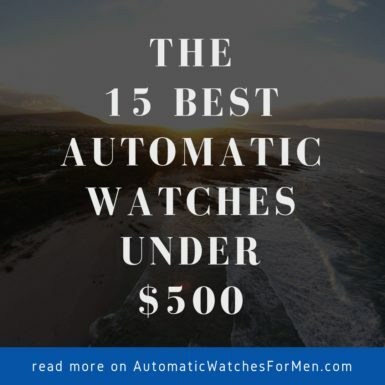 If there’s any other automatic watches out there that you think should be in this list, do let me know by commenting below. I’d love to hear your suggestions (and to lengthen this list longer LOL!). I can totally understand why you put the black Tissot in the first place. A chronometer at below $500?? You got to be kidding me! Last time I checked Swiss Chronometers used to be above $1,000 at least. Just wondering how can TIssot produce such model at such a killer price Isaac? Hi Kyle. Yes, it’s true. Though I need to make it clear the under $500 price is only possible if you get the watch from an online shop. It’s quite hard to find any Tissot automatic watch under $500 at any boutique store in my experience. From the looks of it, I dare say Tissot managed to offer the Chronometer at such a great price by reducing the dial complexity (it has a quite plain looking, though still looks sleek). A simpler dial makes the production easier hence cheaper price. Very nice list of automatic watches here mate. Just wondering how much will the service cost of these watches be? Will it be cheaper to just buy a no-frills normal watch then? Hi Kyle. I’ve found that the service cost varies depending on your location – whether you have a local watchmaker that can service the movement or any authorized service center or not. If your area don’t have these, then it might be a hassle to send the watch to them either by hand or by postage. Service cost of these watches are not that expensive as they are considered normal/average movements in the market, though perhaps the Powermatic 80 movements are quite new and might need special services by authorized center. Just wondering is 39 mm watch size is big or small? I have a medium-ish wrist and will it fit? Hi Mike! 39 mm is the classic-ish size of watches, and is smaller than the current trend of 43-44 mm sizes. If you have a medium wrist size, I’d say it will be a perfect fit! Do let me know how it turns out ya. This is a very thorough review and round up of info on these particular watches. Thank-you for that! I’ve been thinking of getting my son a watch for Christmas because he actually uses one for his work. He’s been wearing a cheaper watch, but I think he would like something a bit more stylish. He has to dress formally in a posh server position. He wouldn’t want something too flashy, but watches in the price range of less than $500 would be fine. I will bookmark your page for further research. With your interest in watches, you probably own several. Do you have a particular way of storing them when you aren’t wearing one? What do you recommend? Thanks again for the helpful research on affordable watches. Hi Stella. It seems my preference changes depending on my mood LOL! I’m currently into dress watches – I love the elegant look that certainly can be used for casual or formal situations. When I don’t use my watches, I’ll put them into a proper watch box to keep them away from dust and accidental scratches from metal objects such as keys, coins etc.